This restaurant franchise capitalizes on Americans’ sense of nostalgia and desire for delicious, convenient food for the whole family. Stewart’s franchise owners benefit from our decades of experience serving a diverse menu to customers who just can’t get enough of our burgers, fries, root beer, and other tasty menu options. Just like our restaurants’ design, our franchise opportunity is modern-meets-retro. Modern because we support our franchisees with all the training, technology, and support they need to thrive. Retro because we still believe that using tested and proven recipes, quality ingredients, and a sense of community makes good business sense. We offer two formats to suit the needs of the marketplace and our operators alike. 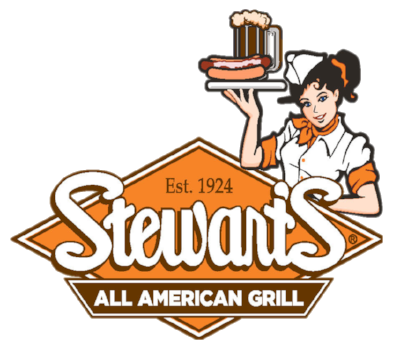 Our express locations which are typically found in a food court type of location operate as a Stewart’s All American Grill. They offer a simpler menu, are less capital and labor intensive and operate in a smaller foot print than our full service locations. Stewart’s All American Restaurant is what our full service locations are named and feature breakfast, lunch and dinner. A full service Stewart’s All American Restaurant features our complete menu—including breakfast, lunch, and dinner as well as desserts and appetizers. 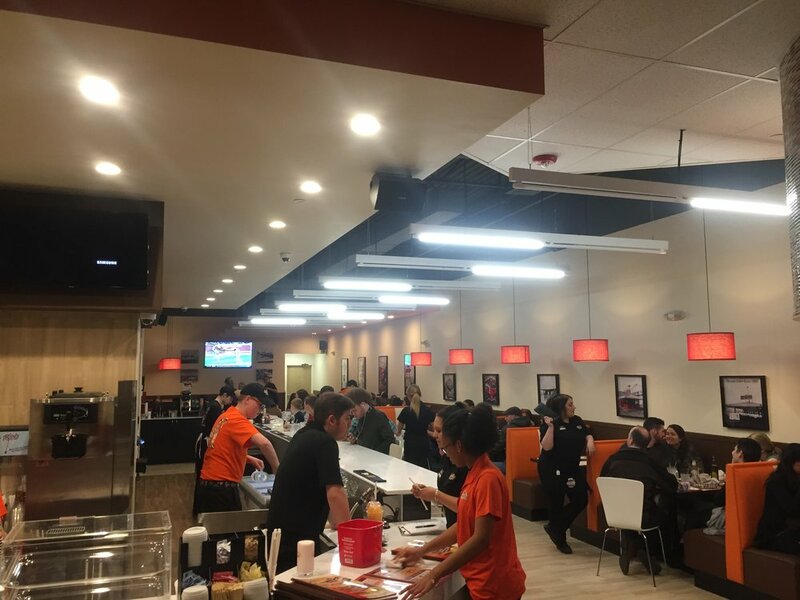 These restaurants allow customers to enjoy a sit down experience with an attentive server, made-to-order food, and one of our famous root beer floats. Alternatively, we have added a sit down counter reminiscent of an old fashion soda bar which gives diners a slightly different feeling of nostalgia, keeping things casual and familiar, with a convenient to-go option to boot and we even offer delivery which is a rapidly growing segment of our business. A full menu of Breakfast, Lunch & Dinner; Everything from waffles, omelets and pancakes to steak burgers, grilled hot dogs, cheesesteaks, crispy fries, Stewart’s Root Beer (served in a frosted mug!) and other soda flavors plus ice cream floats, shakes, cones, sundaes and other treats! 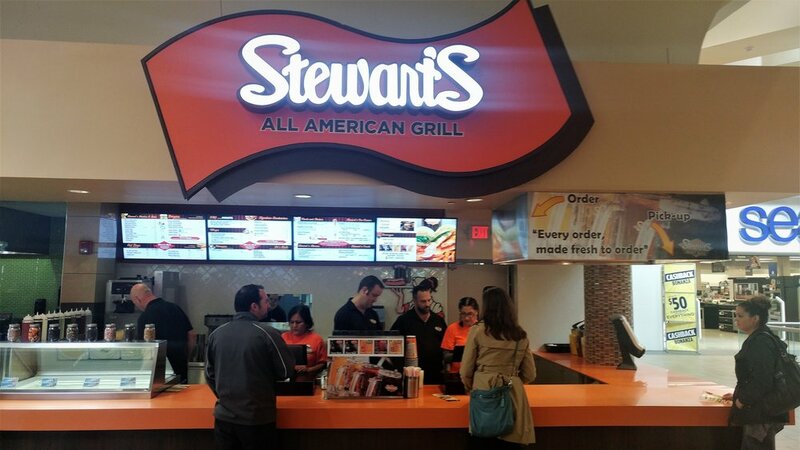 Choosing a Stewart’s All American Grill express format gives you the means to serve customers delicious food quickly in a fast casual restaurant franchise setting without a complicated menu and without the expense of operating a dining room. Stewart’s All American Grill customers take their food to go or eat in the common seating areas that your franchise may share with other tenants and most locations also offer delivery as well. Express restaurants are a perfect fit for non-traditional locations like airports or movie theaters, or even mall food courts. work with you to help design and build your location. We will provide initial and ongoing training, operational & marketing support every step of the way.